Metal properties can be seen as old technology. Copper has the capability of cleaning bacteria from water, and of determining if water is acidic. Having this type of knowledge at a time before water testing strips could have been detrimental to the health of all the people in a single community. Copper has been used and traded across many continents for centuries. Tlingit Men would carry large copper shields at parties called Tinaa to show their wealth and status. Much of the copper that was used in Tlingit territories came from the Copper River located just north, toward the South/Central area of the state. 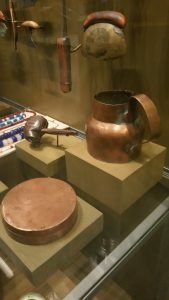 This particular copper cup and snus box are items that were traded in the 1800’s by the Russians that had laid claim to the area. 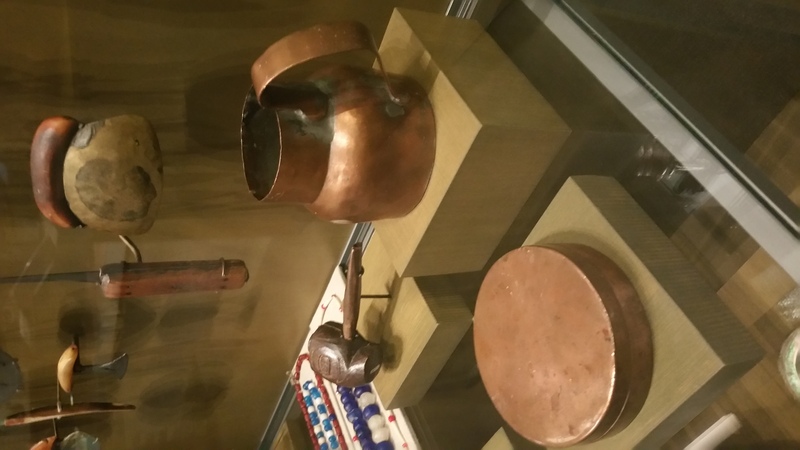 Other items featured in the exhibit included a copper tea kettle and jewelry. I did not know any of this information about Copper. Thank you for sharing it Cecelia!